Pig pickin’ and family festival welcomes paddlers the Friday night before the race at the Eastwood Road Coastal Urge location. Wilmington, North Carolina, January 7, 2016 –Plans are underway to welcome a record number of paddlers to the 8th annual Cold Stroke Classic race in Wrightsville Beach, NC on Saturday, January 23, 2016. 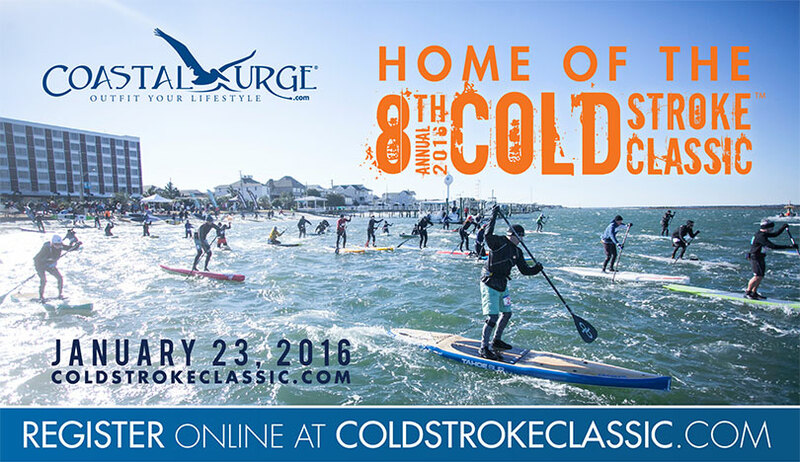 The Cold Stroke Classic was one of the first standup paddle races on the east coast. “That was back when everyone was paddling big surf-style boards. We wore full wetsuits to paddle in the winter.” Though equipment has advanced, and racers now have actual bib numbers (as opposed to the paper plates and duct tape used during the first year), the spirit of the event remains the same: fun first. Last year, Coastal Urge added a Friday night pre-party to the event to encourage participants to meet up and catch up with each other before the friendly rounds of competition the following day. This year the pig pickin’ has been expanded to add more family activities, including hula hoopers, live music, and a bounce house. Jeoffrey said “The point of most of these races is to get together with our friends, so we wanted to make it more of an all-inclusive experience.” Dinner is free with race registration and $7 for non-racers. Everyone is welcome to mingle, listen to music, consume craft brews donated by Natty Green’s and try their hand (waist?) at hula hooping. “We’re getting a bigger pig this year, too!” he said. Saturday’s race is headquartered at the Blockade Runner on Wrightsville Beach. “The Blockade Runner is a perfect location for our race with ample space for demos and exhibitors on the sound side beach and a natural launch point for the course.” A $99 special room rate is available for paddlers that weekend. Beyond the camaraderie and challenge afforded by a mid-January event, all racers have the chance to compete for cash and prizes donated by Coastal Urge brands including The North Face, Southern Tide, Patagonia, Mountain Hardware, Olukai, Kiel James Patrick, Prana, Vineyard Vines, L*Space, Mountain Khakis, BANXBlock and many more. There’s a cash purse for the elite race, and $8,000 in prizes for the elite and 3.5 mile recreational races. The Cold Stroke Classic and other Coastal Urge races always have a charitable component. This year, race proceeds will benefit the St. Baldrick’s Foundation, which raises money to fund research to fight childhood cancers. According to the Foundation website, 1 in 285 children will be diagnosed with cancer before the age of 20. Cancer behaves differently in children than adults. While many adult cancers can be discovered early in the stage, most childhood cancers have already spread by the time of diagnosis. St. Baldrick’s funds research to help conquer childhood cancers. By registering for the Cold Stroke Classic paddlers will be contributing to this important research. A raffle will raise additional funds. There will also be a donation bucket for the nonprofit where Natty Greene’s pours free beer donated toward the cause. Throughout the day there will an exhibitor’s expo open to the public with free demos. The course will begin and end at the Blockade-Runner Beach Resort for both divisions. All paddling for the race will be on intracoastal waters. Racers will have on the water assistance from the volunteers, the Coast Guard Auxiliary and SeaTow. More information and to register visit http://www.coldstrokeclassic.com. Coastal Urge is a family of stores specializing in outfitting the active coastal lifestyle. There are six stores open in the Wilmington, Wrightsville Beach, and Myrtle Beach areas of the Coastal Carolinas. Available brands include Patagonia, The North Face, Carve, Arc’teryx, Prana, Southern Tide, Vineyard Vines, Lilly Pulitzer, TOMs, Mountain Khakis, Olukai, Mountain Hardware, Southern Marsh, UGG, and Costa, among others. Owners Jeoffrey and Catherine Nathan opened the first retail location in 2008.